We're your local fulfillment company! Shipvine can handle daily orders from 1 to 1,000 so no matter what you need to ship we're here to help. So if you're currently shipping products and want to outsource to a 3rd party fulfillment or you want to move your products closer to where you are, Shipvine is here to help. Being based in Richmond, Virginia, also known as RVA or the River City, you've got a local person you can count on to ship your products fast and easy. 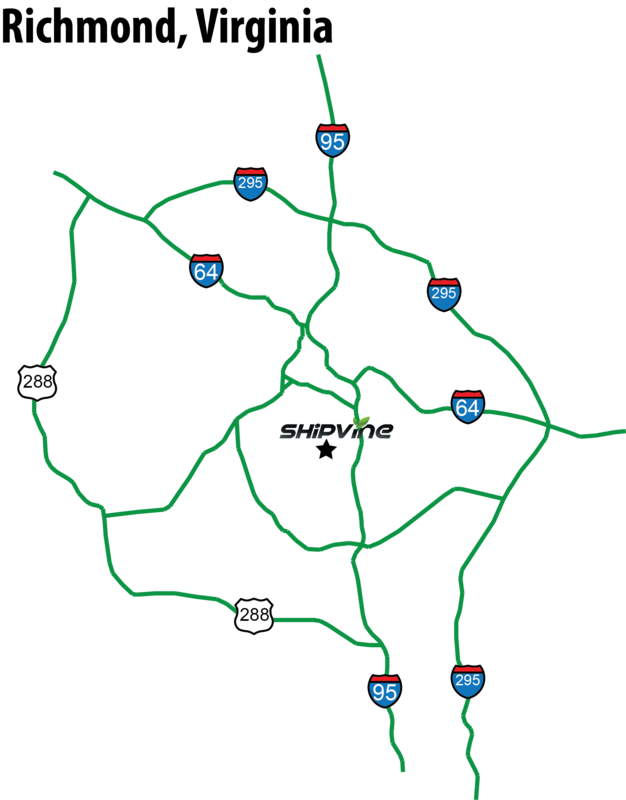 With our convenient location in the Manchester area of Richmond, right off I95, we can be accessed quickly and easily. Contact our sales department today to speak to a local person to help with all of your shipping and logisitics needs. We can even come to your place of business to sit down and discuss your needs. Our office hours are Monday - Friday 9 AM till 5PM eastern time.